On the road again - delivery by truck or on the water ? I once had my 37', 14 ton trawler trucked from Barrie to Fergus Ontario so I could work on her over the winter in the backyard. I made the mistake of following her on the road. It was a stomach wrenching experience to watch 14 tons of boat jumping 6" in the air at 70mph. Although overhead wires in Ontario are regulated at a minimum height of 18', my 15' high boat tore down telephone and electrical cables many times in that short journey. Damage was fortunately minimal but my preparation for the return journey was much more thorough. It may be worthwhile having pre and post shipment surveys depending on how much money is involved. Given the rigors of loading, unloading, lifting on travel lifts and over the road transport, proving damage occurred on route may be difficult. If you prefer not to hire a surveyor for this, at least take dozens of time/date stamped photos at loading. You or your representative must be present when the boat arrives to take more photos. If you show up three days after she has been dropped off and find damage ..... well the finger pointing between trucker and yards begins and without proof, you loose. Check out the transporter as thoroughly as you checked out your surveyor, there are more than a few horror stories out there. Ask the yard if they are familiar with the trucker and how good they are about properly securing the vessel on the truck, expertise and reliability. Check with your insurer to see if they know of any claims against the trucker. Much damage can be done if the trailer pads are placed between bulkheads which is not uncommon. Get several references and preferably on the same type of boat. At 70mph loose objects on or in the boat can become projectiles, so secure everything, leave nothing loose. A gallon container of oil, the electrolyte from unsecured batteries or even a jar of pickles can do tremendous damage. The less gear on the boat, the better. While it may not be practical to empty fuel tanks you should certainly empty waste and water tanks prior to transport as the free surface effect of several hundred pounds of fluid can be devasting. The trucker expects to pick up a boat that is properly prepared for the journey. He is not going inside the vessel to check, that is your responsibility. He is not going to dismantle the dodger/bimini or enclosure and secure all the frame work, that is your responsibility as are loose lines on deck and anchors in bow rollers. Imagine a 35lb. anchor swinging loose at 70mph ! If the vessel is being trucked from warm weather to cold, she must first be winterized. You can hardly blame the trucker if she arrives from Florida to Ontario in February with a cracked block due to freezing. Water in the bilge when she leaves Georgia may not be a problem but when it freezes in Ontario it may very well be. Even if not going to cold weather, draining the exhaust system is a very good idea as sudden braking or acceleration could push water in the mufflers up into the cylinders. Request a copy of the truckers insurance and email it to your insurer for his opinion on whether the trucker has the proper endorsements and insurance limits. Get a written contract. if the truck shows up with a name different than the company you hired you better find out why before you let him load the boat. Make sure that the truck that shows up looks in as good condition as the one on their website. If for whatever reason you cannot ship her by truck or run her up from Daytona yourself you may wish to hire a delivery captain. There are a million guys hanging around the docks who'd be thrilled to go for a boat ride on your dime, some will do it for free and may well be worth what you pay. Some will do it for a dollar a mile. The dollar a mile guys worry me in that it is in their best interest to put the hammer down and get her there as fast as possible, Running a diesel at full throttle for five or six days is not good for the boat. Some captains will be pleased to take you along for the ride but I won't. I'll never take a boat out in dangerous conditions but I frequently head out in unpleasant weather when most would stay on the dock. Delivery days start before the sun comes up and continue until near sundown with occasional overnight runs. Some clients are not prepared for the rigors of a run like this. I have had a few bad experiences dealing with violently ill people throwing up all over the boat and others who insisted on playing with the radar while crossing busy shipping lanes in heavy rain and 12' seas. I had one gentleman who wanted to pilot his boat into his home marina and after getting it into a very dangerous (irretrievable) position in a cross wind, walked away from the wheel saying "You take it". I travel with my own crew, my partner in life and trusted best friend, Sharon, whom I know can be trusted in all conditions to do what is required. If an engine goes down I need to know that while I'm working on it, there is someone trustworthy at the helm. 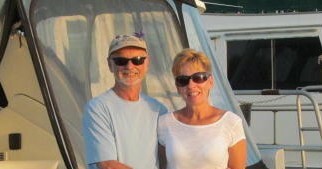 Sharon and I are quite comfortable handling 60' + through locks but on longer trips or longer boats, we may wish to have additional crew and those too will be trusted and experience friends whom I know can be counted on. The experience of your candidates will show in the questions they ask before accepting the job. They will want a letter from your insurer proving coverage. They will want copies of the bill of sale, registration or license and a customs clearance number for cross border deliveries or some method of insuring taxes/duties are paid at the border if applicable. They will want a copy of the most recent survey and detailed information as to recent work on the boat, current condition and preparations made for the trip. Any skipper worth his salt will also want basic spares onboard i.e. oil, oil filters, fuel filters and impellers. I also request that the boat be fueled when I arrive as I will be departing at sun-up. You do not want to pay me to hang around for half a day before the summer help shows up to open the fuel dock and then another couple of hours for them to find the keys to the fuel pump. Even licensed captains do not carry insurance for this kind of work so you should get an approval letter from your insurer for the hired captain to be covered under your policy. Quite often the insurer will OK your choice even if unlicensed if they are satisfied with their experience. On larger dollar vessels, the insurance company might insist on a licensed captain. Either way written confirmation to the captain must be provided. Upon arrival I will take a number of photographs of the vessel as I try very hard to deliver it in exactly the same condition as I picked it up. I insist on some time to crawl around the boat to familiarize myself with locations of seacocks, inspect battery installation, mechanical systems and to inspect fuel filters. I like a beer as much as the next fella but I will also ask that any alcoholic beverages be removed from the vessel. Most qualified delivery skippers will charge a daily rate plus all expenses from door to door (their door that is), My door is Toronto, Ontario. We will provide an estimated time for the trip and require pre-payment on that estimate and initial travel (flights, etc.) costs. We will not deliver a vessel on trips of more than 3 days without autopilot. You will have to provide your captain a method (cash or credit card) of paying for fuel, dockage, food, canal transit passes etc. On certain trips we will require radar. Cooking, potable water systems and head must be functional. All electrical systems must be safe and functional. All required safety gear must be functional and in good condition.i.e. bilge pumps, life jackets, fire extinguishers. All navigation gear including appropriate charts,running lights, VHF, GPS, Sound signalling and compass must be functional. Upon our arrival at the vessel the first few hours will be spent on familiarization. You must ensure your insurance company of who is taking command and get their approval. This has never been an issue as most insurers already have us on file. Lastly any alcohol must be removed from the vessel before we take command. We will provided you with a daily log and a final accounting after delivery.